The Seattle Seahawks are famous for raising decibel levels in their home stadium to record heights during their NFL home games, with its denizens known as ‘The 12th Man.’ (Aside: Yes, we know, Texas A&M University fans. You had the 12th Man first. We get it. But there’s room to share). Now Alaska Airlines wants to take a group of those 12th Fans to New York for next Sunday’s Super Bowl. The carrier and Seahawks quarterback Russell Wilson are teaming up to fly a plane-load of fans to the Big Apple, complete with an inflight tailgate party and admission to an exclusive game day party in midtown Manhattan. The four-day sweepstakes, dubbed the "Russell Wilson 12th Fan Airlift," launched on Alaska Airlines' Facebook page. But, sorry, displaced Seahawks fans. This contest is only for residents of Washington, Oregon and Alaska. Fans have until 11:59 p.m. Pacific time Sunday, Jan. 26, to enter the sweepstakes for a chance to win two tickets aboard a specially themed aircraft dedicated to Wilson that will be revealed for the commemorative Feb. 1 flight. 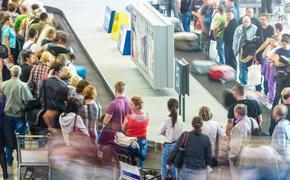 Each of the 56 winners will be selected at random and receive two roundtrip tickets, two nights of hotel accommodations, and transportation to and from Newark Liberty International Airport and their hotel. In addition, the winners and their guests will be invited to attend an exclusive game day party at a midtown Manhattan venue. Sweepstakes winners will be notified by phone and email on Monday, Jan. 27. Alaska Airlines launched an exclusive auction for MVP Gold and Gold 75k Mileage Plan members to bid for five pairs of seats in the first class cabin. Miles raised in the online auction will be matched by the carrier and donated to Seattle Children's Hospital, where Wilson regularly visits young fans receiving care. Alaska has enhanced its support of Children's during the 2013 football season, donating 100,000 miles to the hospital for each pass or rush touchdown Wilson throws or scores. So far, 500,000 miles have been donated to Children's. Alaska will double its donation to 200,000 miles for every pass or rush touchdown Wilson scores in the Feb. 2 game against the Denver Broncos. The "Russell Wilson 12th Fan Airlift" sweepstakes is the third in a series of promotions that Alaska Airlines and Wilson have launched this month. In "Russell's 12th Fan Rescue," six fans and their guests were "Russ-cued" from rival territories across the nation, and each received an all-expenses paid trip to Seattle on Alaska Airlines, plus playoff game tickets. More than 3,000 entries were submitted in the nationwide contests. 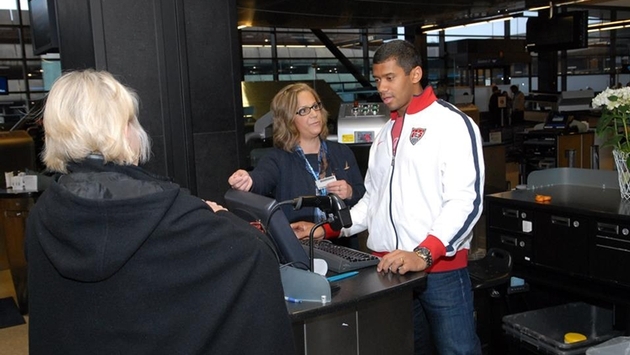 Alaska Airlines named Wilson its honorary "Chief Football Officer" last month.